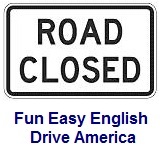 ﻿ Fun Easy English - Drive America - United States of America road signs, rules, and regulations guide, recreation direction. Recreational and cultural interest area signs for directional purposes provide information related to the location, direction, and distance to a specific area. The United States highways and roads are filled with these signs making it much easier for you to find your destinations. Yosemite National Park is located to the left. Great Smoky Mountains National Park is located to the right. Yellowstone National Park is located 2 miles ahead. Carlsbad Caverns is located 10 miles ahead. Blue Springs is located to the right and has tent camping, trailer camping, and a lighthouse point of interest. Cedar Creek is located to the left and has a marine recreation area. Winter sports are located in the winter recreation area to the right. The VA National Cemetery is located off of Exit 245.